A bowl of breakfast cereal. 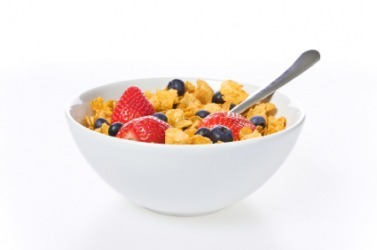 The definition of cereal is a grain, or a breakfast food made from roasted grains and usually eaten with milk. An example of a cereal is wheat. An example of a breakfast cereal is Cheerios. "cereal." YourDictionary, n.d. Web. 17 April 2019. <https://www.yourdictionary.com/Cereal>. Any of several other plants or their edible seeds or fruit, such as buckwheat or certain species of amaranth. A food prepared from any of these plants, especially a breakfast food made from commercially processed grain. From Latin cereālis of grain from Cerēs Ceres ; see ker-2 in Indo-European roots. A grass, such as corn, rice, sorghum, or wheat, whose starchy grains are used as food. Cereals are annual plants, and cereal crops must be reseeded for each growing season. Cereal grasses were domesticated during the Neolithic Period and formed the basis of early agriculture. (countable) A type of grass (such as wheat, rice or oats) cultivated for its edible grains. (countable) A particular type of breakfast cereal. From French céréale (“having to do with cereal”), from Latin Cerealis (“of or relating to Ceres”), from Ceres (“Roman goddess of agriculture”), from Proto-Indo-European *ker- (“grow”), from which also Latin sincerus (English sincere) and Latin crēscō (“grow”) (English crescent).